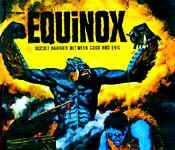 Originally a British WWI officer who solved the Box and was made into the leader of the Cenobites. He was reminded of his past by Kirsty when she showed him his photograph. This knowledge weakened him. The Channard Cenobite attacked Pinhead and turned him back into his human self before slicing his neck open with a tentacle knife. As a human, he helped save Tiffany and Kirsty by distracting the Channard Cenobite. 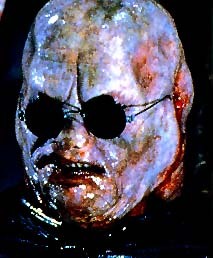 He was the last Cenobite to die by Channard. His face was on the torture pillar that came out of Julia’s mattress. She has a nail through her nose and wire through her cheeks pulling apart a split in her neck which makes her speak in a raspy whisper. 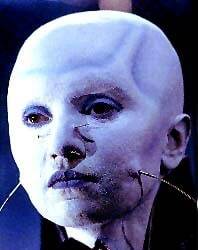 She’s the only Cenobite with hair; she has two fine hairs stretching horizontally from her head. Originally, she was a pretty blond woman. Mute Cenobite. He’s very fat and his ears have been cut off. He wears blind man’s glasses which hide eyelids sewn shut. He constantly fingers the wound in his belly and licks his lips. Originally, he was just a fat man. 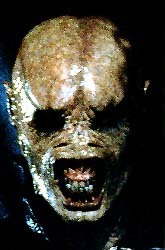 A yellowish-colored, mute Cenobite. He clicks his teeth together constantly because the skin around his mouth is held open by four hooks connected to wires that stretch around his head. His ears are cut off and his eyes and nostrils are covered because of the scarring on his face. Shortly before he died, he was reconstructed. The wires used to stretch his mouth were taken off, but indentations remained. The scar tissue on his face was removed and his beady ears and flattened nose could be seen. He was also given ears once again. Originally, he was a little boy. 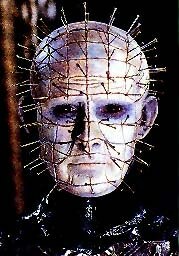 He was lured into Hell by Julia, where Leviathan made him into a Cenobite. 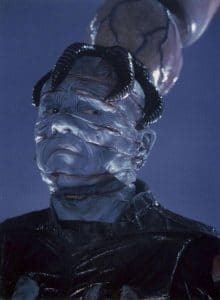 As a Cenobite, he’s connected directly to Leviathan by a tentacle, not unlike the brain drill he used in surgery. He wanted to take over as Hell’s new leader. He killed the four original Cenobites. Later killed by Leviathan whose his head off when he is defeated by Kirsty and Tiffany.